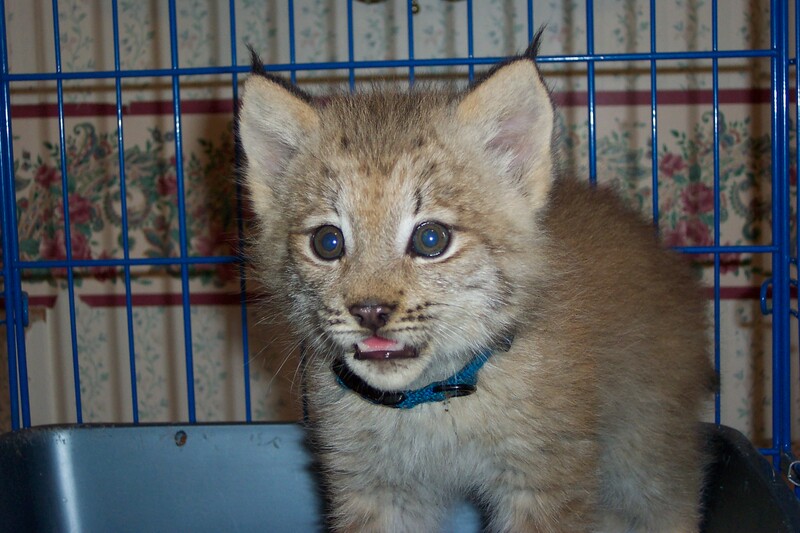 Maxwell “Max”, the Canada Lynx was born May 4, 2011 at Space Farms Zoo and Museum. He came to live with me on June 23rd and weighed 3 pounds 2 ounces. For those who don’t know… in order to educate and/or exhibit with a mammal one needs a USDA federal exhibitors license and follow required guidelines. I’ve had my license since 2008. In the State of New York, one cannot possess a native animal for education without a state license and in the case of the lynx because they are no longer present in the State, an Endangered Species License. I’ve had licenses for black bear, bobcat, opossum and woodchuck. I received the Endangered Species License for Max before I acquired him from Space Farms. People always ask if Max could be released into the wild and the answer is NO. Once an animal is born in captivity and been introduced to humans, they cannot be released. Lynx are taught to hunt by their mother and how to eat whole prey. They are taught survival skills and are wary of humans and other predators. There are some programs in which captive cats have been released but then they have prey introduced to their enclosures and have absolutely no contact with humans. People dump kittens and cats on the sides of the road believing they will hunt and survive but in most instances, these domestic felines perish or get just enough food to barely survive and are neither healthy or happy. People are foolish and cruel to do this. Max has only known humans as his caregivers. He knows that his food comes daily and is cut into Max-size bites or store-bought chicken legs. He receives clean water daily and has shelter from the elements. He has an indoor enclosure with a litter pan and dog house along with shelving. He is fed and watered here. Outside he has a covered enclosure filled with cedar mulch for lounging and going the bathroom. Max has lots of different height shelving around his enclosure to jump up on to sun or lie in the snow. He has another dog house. As of summer 2017, Max has a 60 foot run area and he uses it daily with a bench and pallet for lying or scratching. Although Max has been cared for by me, he’s afraid of all other humans. In July 2011, Max was treated for hookworms and coccidia which is sometimes normal for exotic cat babies. It was an easy fix. In September 2011, Max was diagnose with EPI (Exocrine Pancreatic Insufficiency) when he was four months old and I started enzymes on his food. EPI is a condition that occurs when the pancreas fails to provide the necessary amount of digestive enzymes. Due to a lack of these enzymes, he cannot properly digest the nutrients in food such as fats and proteins (maldigestion). Baby Max started cutting his adult teeth from October to December and by December I could discontinue the enzymes on his meat. October was when Max was neutered as I was not going to breed him and I thought perhaps neutering would settle him. At a year old (2012) Max weighed in at 25 pounds and his blood panel showed his pancreas was functioning normal. He had a shoulder height of 19 inches and was about 30 inches long. However, 2013 his blood panel showed some kidney issues and Max was put on a special diet. I decreased his red meat, increased boned chicken and added a special canned food. By this time he was weighing 28 pounds. Six months later I was able to discontinue the special diet. In July of 2014, I was worried about Max’s physique. He had normal weight but seemed so very thin even though he loses his winter fur by summer which makes him look thin. I changed veterinarians and he ran a full blood panel. Results showed that Max once again had EPI, and low B-12. I started adding enzymes to his meat again. By August Max had gained four pounds but was aggressive. The vet said that he would feel better once his system settled down. January 2015 Max was at 35 pounds and blood work showed that the enzymes were doing their job. He was looking and feeling better. However, he will be on these enzymes for the rest of his life. Max eats 1.5 pounds of raw meat daily, usually red meat or chicken legs. 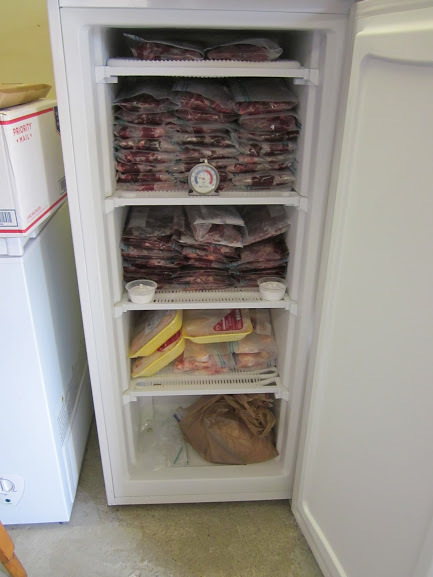 The red meat comes in 50 pound cases in which I thaw, cut and weigh into meals for Max. 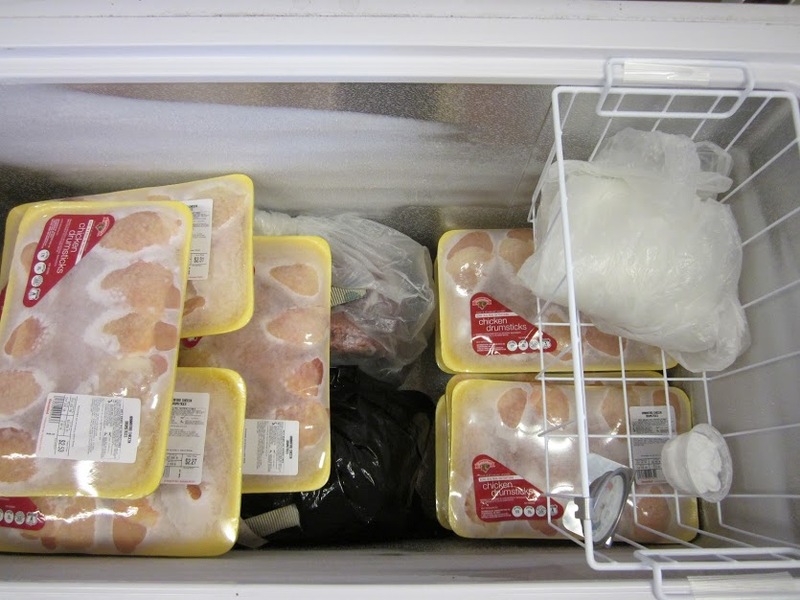 I have two freezers for the boy; one has prepackaged meals and the other holds cases. Enzymes are placed on his food daily. He also gets powdered vitamins mixed into his red meat. In January 2016 Max topped the scale at 40 pounds (see Big Baby video at https://youtu.be/lKJkKnaImic) and in the summer he drops his 4 inch fur and 5 pounds. Max begins shedding his fur in March and by summer he’s slim. His winter fur then begins thickening in September. Now fully grown Max is about 3 feet long with a shoulder height of 2 feet. His paws measure 4 inches across and are webbed for walking on snow. There are lots of videos on our Wildlife Bernie YouTube channel. There’s everything from Max growling with a chicken leg to purring in my lap. There’s brushing videos and catnip videos. By the way, Max goes wild for catnip and Honeysuckle wood. He also chews up toys within minutes and therefore it’s been challenging finding a toy that outlasts a lynx’s playtime. I say Max is humanized because he’s not like a domesticated house cat. It takes hundreds of years of breeding to domesticate a wild animal. Max shakes his meat to make sure it’s dead before he eats it. He will growl at me if he feels like I’m going to steal his chicken legs. I don’t fully trust Max. I have learned to never turn my back on him because he thinks it’s funny to stalk & jump on me. I can’t tell you how many times I have been given the slap to the head. He does lie in my lap but for all of 10 minutes before he loses attention and want to play rough. He has never bitten down on me. I do get plenty of scratches and Max has all his claws. I don’t believe in declawing. It’s a cruel and devastating procedure. Max soft paws me most of the time. When he gets really excited the claws do come out but a simple “No” usually deters that behavior. I tell him that we don’t play rough and usually end our time together if he doesn’t stop. Most times asking for his “face” does the trick. He knows that the face means scratches and snuggles. Something he loves! Max doesn’t live in my house. He has an indoor enclosure of 4×6 with a walk-in height of 6 feet. There’s a window opening that leads to a covered 6×12 layered with cedar mulch to a 5×10 and 10×15 off the side. Both have wire covering to allow the elements to come through and grass. These sections are walk-in height with a dog house and shelving of different height since Max likes to jump and relax at a high level. Off the 5×10 through a gate is a 15×60 run area with an 9 foot wire cover. This area has shade from a tree & shade cloth, bench and pallet. It has lots of places for Max to snuggle down in the grass. Max marks his territory everywhere although he’s been neutered. He’s rusted galvanized steel completely and I’ve had to replace several of his cage panels. There are videos on my channel of his area. I was a zookeeper for five years and have experience handling all the big cats including the lesser ones like bobcat and lynx. I have the knowledge to care for Max. This is a cat that you cannot just feed kibble and canned food. It’s a 35-40 pound powerhouse. Max can leap 9 feet across the room and accurately land on my shoulders. Not to be encouraged. He can leap 6 feet straight up! He’s not a pet but an animal ambassador. He has been in the public since he was 8 weeks old educating and enlightening people. We really need to stop and think about what we do to our environment. We need to slow our population down and consider our carbon footprints. We need to protect our land and oceans. The lynx disappeared from the State of New York by 2000. That was only 18 years ago! They were abundant here and we destroyed their habitat therefore reducing their prey, the Snowshoe Hare and we killed them for their fur because who wouldn’t want a lynx coat? By using my exotic animals and specimens, I connect kids to wildlife. Get them to care, they will protect.